Insert the charging cable into the Micro USB input port, connect the USB plug into 5V USB power terminal. The charging LED indicator will turn on.After charging completed, the LED indicator will turn off. 1. Bluetooth pairing for music / phone call/ camera remote shutter. 2. Turn on your device and activate the Bluetooth function. 3. Search for Bluetooth pairing name "NO.1" and click to pair, the speaker will pair automatically and the speaker will have a voice prompt. Then, you can play music or just to press the button to answer the call when the call is coming. Double click button of the speaker to transfer the selfie mode and keyboard mode (You will hear a sound which like taking picture or keyboard). Under selfie mode, one click to take a photo when open camera APP. (If choose Camera APP, continuous click to up volume); Under keyboard mode, one click to Play/ Pause. 1. When music sound becomes smaller you hear the warning tone, please charge this speaker in time. 2. It is keyboard mode when open the speaker by default. 3. The mini Bluetooth speaker can be played while charging. Amazing Quality Sound and TWS function---With the 3W Audio Driver and true wireless stereo technology, the amazing, miraculous sound and robust bass is impressive. You will be surprised that how it could come from such mini TWS speakers. 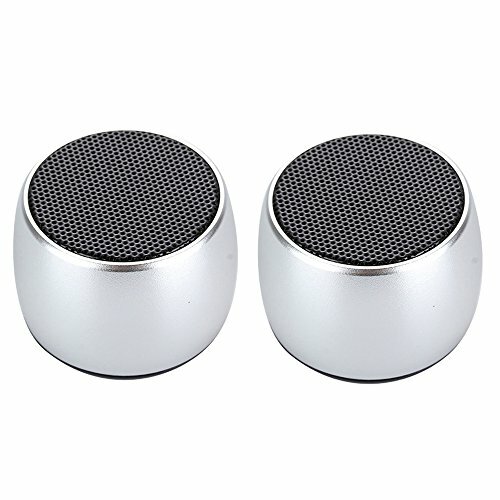 Mini Portable Bluetooth Speaker ---The compact size which just like a ping-pong ball that you could take it to anywhere, attach to backpacks, purses, handlebars,bike and so on with the lanyard(included). With magnetic suction, the speakers can be attached to each other or adsorbed on other objects. It can be adsorbed on the refrigerator, metal, also the other non-metallic objects with the sticker(included). Selfie Remote Function---Remotely activate camera remote shutter for photo and video, Built-in noise reduction microphone, sound quality, a key to answer. turn on / off the music APP and click to up volume. Built in mic is convenient for Hands-free options. Rechargeable Lithium-ion Battery---- that provides around 4 hours playing time(depends on the sound level and what you do with the speaker). It takes about 2 hours for a full charge. It is easy to charge. Bluetooth Connection And Intelligent Compatible---Easy wireless Bluetooth Connection with the Smart phone, tablet PC and other Bluetooth devices. Bluetooth 4.2 wireless transmission technology, wireless connection, high-speed and stable anti-interference. Smart compatible with various Bluetooth devices in the market. If you have any questions about this product by Omier, contact us by completing and submitting the form below. If you are looking for a specif part number, please include it with your message.